The LPRCA partnered with the Nebraska Watershed Network based at UNO and directed by Dr. Alan Kolok on a grant to the National Fish and Wildlife Foundation in 2015. The project’s focus is to engage high school students as well as community groups in region-wide water quality monitoring. 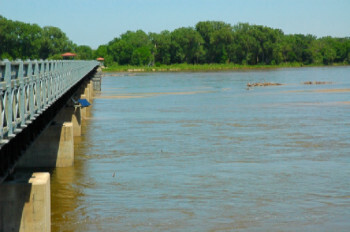 The monitoring portion of the project began on April 20th and will continue for ten weeks each Wednesday at ten different sites in the Omaha metro area, along the Platte River and the Elkhorn River. Platte River locations include Two Rivers SRA and near Louisville. The students/citizens have rapid water quality tests to determine atrazine load as well as nitrates and other nutrients. Additionally they collect samples to test for e-coli that are then collected within 24 hours by UNO graduate students and results run in a laboratory. All results are input into a database by the graduate students that can be accessed by all the students or citizens involved to compare results. The project has multiple benefits including engaging youth and general citizens in water quality issues and in the Platte River and adjacent landscape. It also provides another dataset to further understand contaminant loads within the Platte River and its tributaries. We look forward to seeing the results from the students/citizens and determining how we can hopefully implement other similar efforts throughout the region.